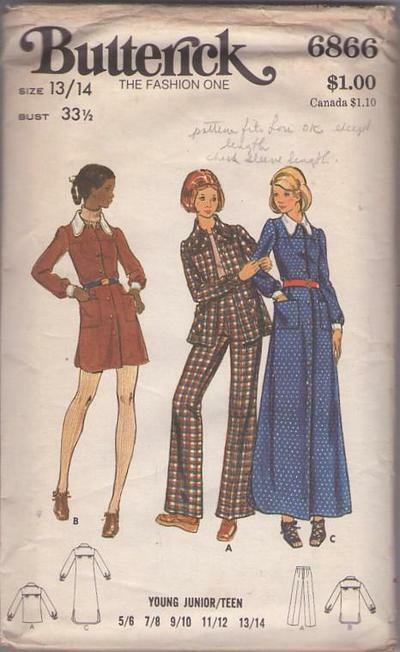 70s Mod, Retro Casual Clothing Patterns - YOUNG JUNIOR/TEEN DRESS, SMOCK & PANTS. Loose-fitting smock or dress in two lengths has shirttail hem, self or contrast shaped collar, front and back yoke, patch pockets, full length sleeves gathered into self or contrast buttoned cuffs, and topstitch trim. Flared pants are darted into waistband. Purchased tops and belts.